Drama Retired doctor Kyohei and his long-suffering wife, Toshiko, prepare to commemorate the 15th anniversary of the death of their eldest son. Youngest boy Ryota, who is now married with a stepson, and daughter Chinami, who has a husband and daughter, both arrive at their childhood home to be greeted by a large picture of their long lost sibling, creating friction between the generations. 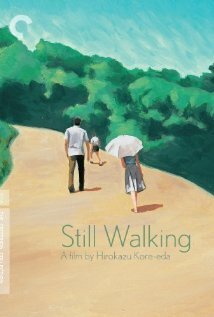 Still Walking is not currently showing anywhere.